Beginning in 1900, the Waxahachie Chautauqua Summer Encampment and Assembly provided two weeks of education, culture, art, and recreation for the residents of Waxahachie, Texas, and Ellis County each year until it closed in 1930. Thousands of people participated in the chautauqua over the years, and this year when the first Chautauqua held at the Chautauqua Auditorium on September 23, 2000, numerous artifacts came out of storage that were kept over the years, handed down by a members of families who attended the Waxahachie Chautauqua and kept some little mementos of the event. The real treasure of the Getzendaner Park (formerly known as Chautauqua Park until the Getzendaner family bought the park from the Chautauqua Association to help keep it afloat), located in the West side of Waxahachie, is its auditorium. A beautiful octagonal-shaped 2500-seat open air auditorium was built in 1902 when it appeared that the Chautauqua movement was going to stay around a while. Unfortunately, the chautauqua stopped in Waxahachie in 1930. And the auditorium, with only occasional use for various community events, fell into disrepair. In fact, it was nearly destroyed until a group of local citizens put together a "Chautauqua Preservation Society" in order to breathe life back into the wood structure. In the mid-1970s the Waxahachie Chautauqua Auditorium was restored and given new life as a monument to community pride. It has been awarded a Texas Historical Marker and a listing on the National Register of Historic Places. The community of Waxahachie came through for the old building that had served thousands of chautauquans over the years. That same community spirit is what lead a new generation of the Chautauqua Preservation Society to put together a one-day Chautauqua program on September 23, 2000. Once again, the proud community of Waxahachie had a chautauqua. The citizens of Waxahachie are sure to hear plenty about what they missed from those who attended. Next years event should show tremendous growth in attendance if word of mouth plays its important role. Kirk Hunter and Maureen Moore are a couple of Waxahachieans who played important roles in the success of the Chautauqua this year. Diane and I had the great fortune of meeting them when they attended the Tulsa Council Chautauqua in June. After visiting the Chautauqua Institution in New York and the DeFuniak Springs, Florida, Chautauqua, they wanted to see what the Tulsa approach to a Chautauqua program would be. I was invited by the Tulsa Chautauqua to put together a small display of items from my collection of Chautauqua memorabilia, and Kirk and Maureen were able to see that. Upon their invitation to bring a display to their chautauqua, we visited Waxahachie the next weekend. We had planned a trip to the Cracker Jack Collectors Association Convention in Dallas, so Waxahachie would only be a couple of hours added to our trip before going to the convention. When we saw that magnificent Chautauqua Auditorium, we were convinced that we wanted to be a part of this event, so we signed on immediately. The Waxahachie Chautauqua Assembly was only the second time that we have displayed our collection. I added enough artifacts from my collection to the display after the Tulsa showing that it almost doubled in size by the time we went to Waxahachie. It was a display that I was very proud of, and I knew it would be a great way for people who attended to learn a little more about the chautauqua experience that they were about to become a part of. The one event on the program that I was really excited about was the speech to be given by Dr. Ross Mackenzie, the historian of the Chautauqua Institution located in New York, on the Chautauqua Idea. I was not disappointed. An important theme in his speech was beauty, and that the Chautauqua experience should include the search for beauty in what we do. I think this is a very important part of the Chautauqua idea. After the program, I had a chance to meet Dr. Mackenzie and to later visit the Parlor Tent where my chautauqua items were on display. I hope his review of my website will meet with as much favor as my collection did. Another highlight of the event was when I got to hear "Conversations with Will Rogers" by Dr. Doug Watson again. I had met Dr. Watson in Tulsa. He was part of our theme of the West in June, and I greatly enjoyed his portrayal of Will Rogers in the Tulsa Chautauqua. There was something magical when Dr. Watson appeared as Will Rogers on the stage of the beautiful Waxahachie Chautauqua Auditorium. On February 26, 1927, Will Rogers himself stood upon that very stage, and his son Will Rogers, Jr. visited there on September 19, 1975. Doug Watson must have caught a glimps of the magic of the moment when he stood up there, because he gave a great performance as Will Rogers to a fairly small audience. I am very fortunate that I was able to be a part of that experience. A third major part of the program that I thought was fairly significant was the appearance of the James Gilyard Ensemble from Dallas. The ensemble performed a great variety of jazz tunes while Gilyard narrated a brief history of jazz music in a program called "All Thats Jazz: From Ragtime to Modern." It was a fun educational program that showcased the talents of the four musicians that comprise the James Gilyard Ensemble. If I ever get the opportunity to see these musicians play again, I will go out of my way to do it. I asked Maureen Moore if they will put together another Chautauqua for next year. She indicated that they had already booked the Waxahachie Chautauqua Auditorium for September 29, 2001. That is exciting news for Waxahachie, Texas. For information on how to become a member of the Chautauqua Preservation Society of Waxahachie, you can contact Kirk Hunter by calling 972.937.8887, or you can e-mail him at khmm@hpnc.com. It is worth the price of admission just to get the newsletter put out by the Society. Diane and I will join this year. And perhaps we will be able to attend another Chautauqua Assembly at Waxahachie in the future. Texas -- The Waxahachie Chautauqua Assembly - 1900 to 1930. "The Waxahachie Chautauqua Auditorium was restored for the National Bicentennial July 4, 1976. It is still in use today as a city auditorium for various functions including several visits each year by the Fort Worth Symphony" -- source: Waxahachie Chautauqua Auditorium. There is currently a small exhibit on the Waxahachie Chautauqua at the Ellis County Museum on the court house square in Waxahachie. 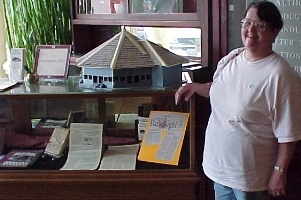 To the left is a picture of Diane with the chautauqua display when we visited the Museum on June 14, 2000. We both enjoyed reading the following article: They Called It Chautauqua by Michael V. Hazel of the Fort Worth Star-Telegram. It discusses the Waxahachie Chautauqua Assembly and other Texas connections to chautauqua. Every Texan who is interested in learning about chautauqua should read it. "At the close of the best chautauqua Waxahachie ever had, the business men, as an expression of appreciation, made it possible to send Rev. J. E. Aubey, president of the board of directors, to the I. L. A. [International Lyceum Association] convention." ~From The Lyceumite and Talent, August 1912. 9:00 a.m. - Opening Ceremonies. "The Chautauqua Idea" is the title of the speech given by Dr. Ross Mackenzie of The Chautauqua Institution. 11:00 a.m. - Celts to Cowboys in the Auditorium; Chemistry in the Science Tent; and Folk Art in the Arts Tent. 12:30 p.m. - Lunch time concert with Threadneedle Street. 1:30 p.m. - Bach in the Auditorium; Chemistry in the Science Tent; and Texas Courthouses in the Arts Tent. 2:45 p.m. - Shakespeare in the Auditorium; On the Wing Again in the Science Tent; and Comanche Indians in the Arts Tent. 4:00 p.m. - Conversations with Will Rogers. 7:00 p.m. - All That's Jazz with the James Gilyard Ensemble and closing ceremonies with the Waxahachie High School Jazz Band. Visit the page about the Waxahachie Chautauqua Auditorium. "They Called it Chautauqua" by Michael V. Hazel in which the Waxahachie Chautauqua is featured. "Everything is funny as long as it is happening to Sombody Else."